Price Drop! Was: $99.95 Now: $74.96. For a limited time only, while stocks last. 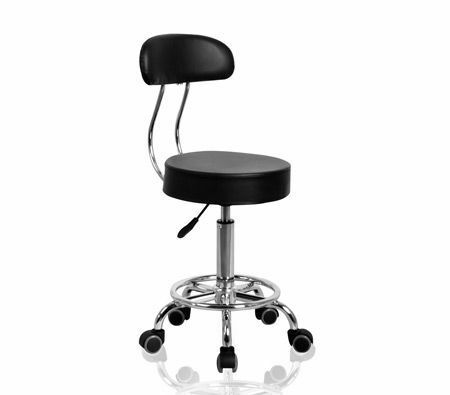 Get off your feet and take a seat in this Black Salon Stool w/Backrest! Perfect for the salon, office, kitchen, tattoo parlor, massage parlor and more, this stool is a sophisticated & comfortable way to take a load off. We all know a comfortable employee is a happy employee is a productive employee, so why not invest in this salon stool to help your workers and yourself? This stool is comfortable and sturdy, and is guaranteed to get the job done. Ergonomic and chiropractic, the backrest adds a level of comfort for those days when you do more sitting than standing. But your back won't feel a thing! With a PVC leather-formed foam cushion, you get maximum comfort. With the iron base foot rest, you also get the peace of mind that comes with durability and long-lasting comfort. The bar stool also offers extensive manoeuvrabilty, with five 360 degree wheels as well as full swivel action in the seat cushion. The gas lift means the stool is easily adjustable to a variety of height settings, so you can always belly up to the bar, kitchen counter, or office desk. If you want to upgrade your kitchen stools, office stools, bar stool, massage parlor stools or tattoo parlor stools, you need look no further than this fantastic user-friendly model. So kick back and let this Black Salon Stool w/Backrest take you for a spin - you'll almost feel like standing to applaud!